This book collects 18 essays covering themes that range across my lifelong experience of contact with Urdu speakers in South Asia. The title essay is an attack upon those scholars who write the history of Urdu literature stressing its inferiority to English literature instead of highlighting the qualities which make it great. During my years of work on Urdu and its rich literature, I have aimed to get to know as wide a range as possible of Urdu speakers. Doing this involved learning about Islam, and the very different ways of life of urban and rural speakers of Urdu. Many of the essays in the section on Islam attack the fundamentalist interpretation and refute the arguments of the fundamentalists. 4. 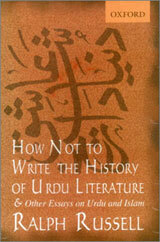 The Urdu Ghazal: A Rejoinder to Frances W. Pritchett and William L.